The Baxi 636 Combi Gas Boiler is a highly reliable condensing boiler that comes with a variety of features and benefits. A compact unit, that comes wall mounted, it’s able to fit inside a 290mm deep cupboard so you can be sure you are going to save that much-needed space in your home. 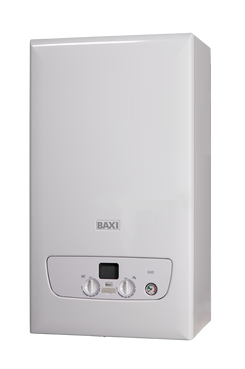 As a condensing boiler, the Baxi 636 is highly efficient and features a ErP A rating for heating and hot water thanks to its 89% efficiency. Available with an output rating of 36kW, this model is perfectly suited to homes with 2 or more bathrooms that have a larger demand for heating and hot water. The range also includes models with output ratings of 24kW and 30 kW which means that there’s a boiler to meet the demands of many homes. Some of the features of this boiler include a low lift weight of 29.5kg, making the boiler easy to install which can help to save you both time and money on the installation, the pipes are located behind the facility within the boiler casing to keep it tidy, there’s an easy fill permanent filling link which makes it easier for householders to top-up the system, brass hydraulic blocks and openTherm Interface, a simple hanging bracket, choice of flue lengths and full compatibility with uSense smart controls. As well as all of this, the boiler is Boiler Plus compliant. Featuring a lengthy 7-year warranty, you’ll have the peace of mind that the manufacturer will look after you long after installation.